Preparing for the forthcoming Creative Research Methodologies Practicum hosted by La Trobe University I am excited. There are a decent bunch of us from La Trobe, Melbourne University, the MIECAT Institute and RMIT University, coming together to share our creative methodologies in scholarship. I laugh to myself when someone outside Australia Tweets: ‘Maybe something similar will be held in Europe or North America!’ It enlivened this tweeter too. Yet such explorations are not ordinary occurrences in academia. If we consider that our methods of engagement in/with the world reflect how we make knowledge, and also what is deemed knowable, this is a worthwhile inquiry. I bring ‘creative’ and ‘research methods’ together to facilitate different kinds of knowing, beyond ‘propositional’ knowing ‘about’ the world (Heron & Reason, 2008). The intent of creative methodologies is open up and ‘harvest’ new layers of understanding/ knowing ourselves and our world. Especially if the knowledge is social in orientation – relating to the complex realm of people in relationship in society and culture. What Reason and Heron describe as ‘radical epistemology’ begins with an experiential, embodied encounter. Here the facilitator/ researcher might create opportunities where participants have the space to feel, to perceive and to distinguish their felt sense of an experience. Once imaginations are alive to our inquiry, the appropriate method is selected that enables us to capture (document) and engage more deeply with our response. This is often a combination of image and narrative methods, such as yarning, exploring narrative viewpoints, art, diaries, photography, soundscapes, video, music, dance/movement, play with images, objects and artefacts. Now we are ready to concentrate our mental facilities and move into intellectual meaning-making, or theorising. Hopefully our theoretical understanding will lead to new practical action or outcomes in the world! Even in the social sciences, this layered process of engagement with the whole person integrating our emotions and imagination with abstract thought, might still be considered ‘unnecessary foreplay’. For participatory researchers these are the conditions that facilitate respectful and meaningful engagement. Let’s dwell philosophically a moment on why this might be, before exploring some approaches that might transcend the mindset that makes ‘creative’ and ‘research methodologies’ an unusual pairing. Creativity happens in the art room and academic research is undertaken in the university. Does that sound like a familiar educational division? Imaginative and scholarly ways of being have been intentionally separated in design, architecture and curriculum. This is not surprising because creative ‘states’, that are embodied, unbounded, messy, open and emotional have, for centuries, been isolated and reduced hierarchically from mental operations that are considered rational, neat, logical, ordered and disciplined. Bringing together these two words then is potentially cataclysmic. When joined in co-creation, the separation between mind/matter, foundational to the Cartesian tradition underpinning Western institutions, is epistemologically challenged. Cascading through our interpretation of reality and meaning-making is the idea that subjective (consciousness) is self-contained. “I think therefore I am” creates the individual mind existing in isolation from objects outside itself. Wilfully making meaning while believing it is separate from feelings, from the nature world, or one’s own human body, in the quest for pure, reasoned thought. Existing in opposition to each other, inhabiting mutually exclusive spheres, binary oppositions are not easily dissolved. Many have sought to reconcile or collapse the powerful binary divide, some I have delved into include, Spinoza’s Metaphysical Ethics, Goethe, Phenomenology, Feminism, Post-Structuralism, Post-Humanism, Ecology, and applications of quantum understandings into society. Attempting to unite these artificial oppositions can lead to chastisement or alienation. Many radical intellectuals have worked outside university and published independently. Most learn the parameters of the game and self-moderate as Ann Rippin describes. “The desire to dissociate oneself as an academic from what is weak, illogical, biased and indeed disruptive, is very strong and thus an element of self-policing around what is legitimate in terms of content and methodology becomes almost inevitable.” Ann Rippin in Broussine, 2008, p.19. Operating in this context, I am learning to build intellectual bridges that justify my use of multi-modal qualitative research methods in my PhD, to be able to bring ‘creative’ and ‘research methods’ together. Such clarity is an important part of this journey. Finding inspirational academic knowledge making along the way is one of the highlights. In cartoon format, the intricate work of Nick Sousanis privileges images over words. Surprising, beautiful and sophisticated, this multi-layered exploration refreshes assumptions about the fixed nature of rational linearity at the top of the knowledge hierarchy. Readers might be challenged by the juxtaposition of symbols, and how one might read the page. That this image is a part of an award winning 2015 PhD, now book, Unflattening alerts me to an interesting movement in the intellectual environment this decade. Unflattening takes readers into a multi-dimensional world. It speaks to me of being ‘A-perspectival’ – a word invented by Swiss cultural philosopher, poet and linguist Jean Gebser (1905-1973). It describes a state free from perspective, and free from rationality. Importantly this freedom is neither irrational nor without perspective. Gebser thinks in the deep time of millennia. He observed a new pattern in Western culture in the early/mid 20th century through expressions of Cubist art, Anthroposophy and Theosophy, Neo-Romanticism and the new physics of Einstein, Bohr and Planck. Instead of seeing these instances as a resistance, in opposition (the way rational consciousness approaches the world), he identified them as an emerging a new phase of human consciousness. Gebser called this consciousness Integral. Integral consciousness transcends the constraints of the scientific method and “dualistic cul-de-sac” via “quanta”, or discontinuous leaps, which I like to imagine as spontaneous somersaults of being (Gebser, 1986). This discovery restores me. Here new ways of knowing at once become possible – four decades before the impacts of the beyond time, beyond space, world wide web. Before the organisations at the centre of my research, were formed and could be staffed by the millennial generation. 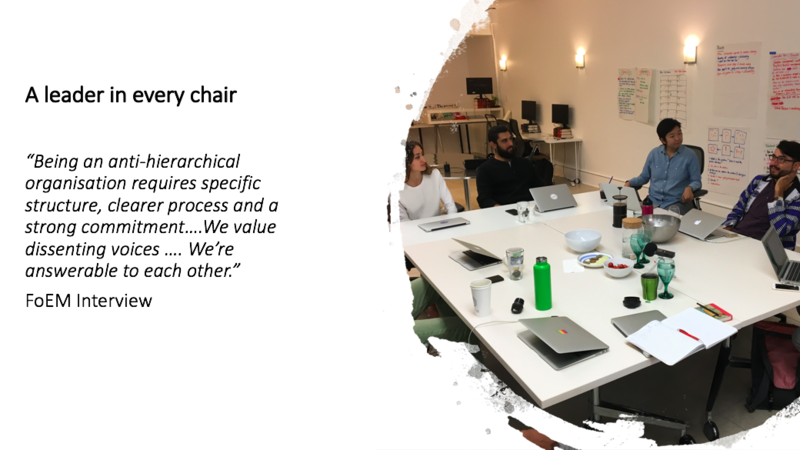 With an Integral world view in mind, the existence of organisations characterised by being de-centralised, non-hierarchical and flexible is not surprising. The entities I am researching resonate with Gebser’s vision, in being co-designed to value individual freedom of expression and respect for diversity (other). They, like Sousanis, are committed to the collective power of the global commons. Their tools and practices facilitate transparent operating systems to aid full participation. Here the intensity and complexity of Sousanis’ way of seeing the world resonates – Allatonce. This century many vibrant alternatives to exclusively technical/material/scientific knowing flourish. While mainstream legitimacy is not sought, it may be found. 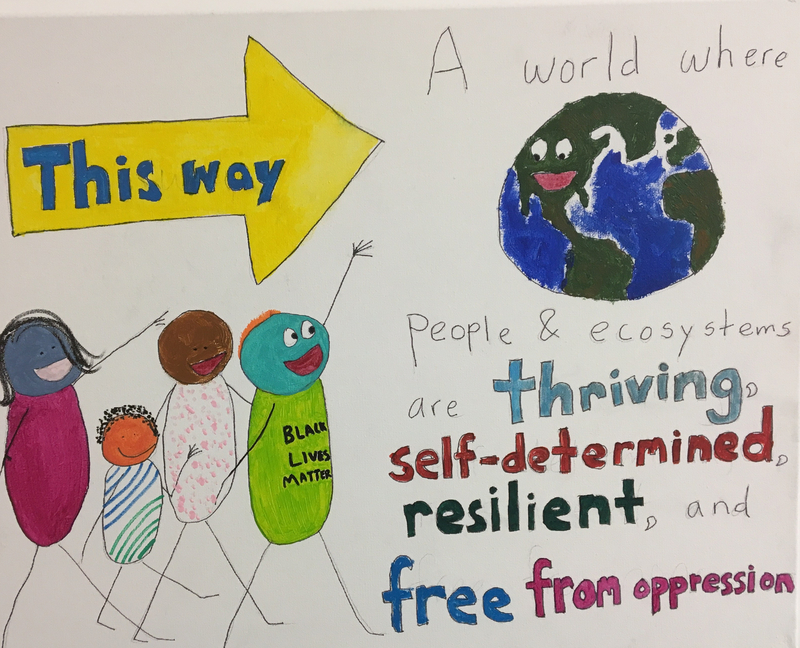 Part 2 of this post focuses on restorative governance and the experience of wholeness marked by permission to dissent. Being willing to listen and being with, through the work of Dr Miriam-Rose Ungunmerr. Expressions of an integrated human who dances in delight in their mental, emotional and imaginal human being. Broussine, M. 2008, Creative Methods in Organizational Research. London, SAGE Publications. Gebser, J. 1986, The Ever-present Origin. Athens, Ohio University Press. Heron, J. and P. Reason (2008). Extending Epistemology within a Co-operative Inquiry. The Sage Handbook of Action Research Participative Inquiry and Practice. London, Sage Publications. Neville, B. and T. Dalmau (2008). Olympus Inc. Intervening for Cultural Change in Organizations. Greensborough, Flat Chat Press. Sousanis, N. 2014, Unflattening, Cambridge, Mass, United States, Harvard University Press.